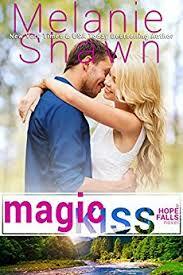 This is the second book I read by Melanie Shawn in the Hope Falls series and I really enjoyed this sweet romance which leaves you feeling all warm and fuzzy on the inside. I loved Logan's character because of his alpha male qualities and the way he respected his friendship and tried to look after his friends family, however I would have liked to see more of Logan's PTSD and how he dealt with it. Emma's character was sweet and innocent and I loved how she was an example of an everyday woman with normal problems. I really enjoyed the fact that Emma was a writer and I loved the scenes where she is writing her book because I manged to get engrossed her novel's characters and I wish that Melanie would bring that series to life. The dual point of view writing style was good, but I did feel that there was not enough drama in the book so for me it began to drag towards the end. The chemistry between Logan and Emma was hot and definitely help pull the reader into the story. I did not like the fact that Drew was acting to mature for his age especially when it came to women and his parents love life. Over all this was a great small town romance which highlights a second chance at love. Logan Dorsey left his job at the military and as an undercover cop when he lost his best friend. He cannot seem to get rid of his nightmares and the only person who can help him is untouchable. Emma Locke, is a romance writer who lost her husband six years ago and now she is unable to find the inspiration to keep on writing her famous romance series. The only man who can inspire that passion in her again is off limits. It is said that time heals all wounds, but will it be enough to help grow new love?